It looks like Peter Jackson is planning to shoot the two Hobbit films entirely in stereoscopic 3D using the new RED EPIC camera. I was really hoping that The Hobbit would escape this pointless 3D filmmaking craze, but it looks like that's not going to happen. The Hobbit is coming to us in the third dimension. Like I said earlier, Jackson will use the new RED EPIC camera, which hasn't officially been released yet. Jackson has been a fan of the RED cameras for a long time already, and actually shot a short film for RED called Crossing The Line. For those of you not familiar with the RED cameras, the RED ONE cameras shoot digitally at 4K resolution, while the new RED EPICS will capture 5K resolution at 120 frames+ / second. The EPIC will have the highest dynamic range ever for a digital camera as well. "The EPIC'S small size and relatively low weight, makes it perfect for 3D - where two cameras have to be mounted on each 3D rig. " I have always liked the look of Red footage. I'm not a scientist or mathematician, but the image Red produces has a much more filmic feel than most of the other digital formats. I find the picture quality appealing and attractive, and with the Epic, Jim and his team have gone even further. It is a fantastic tool, the Epic not only has cutting edge technology, incredible resolution and visual quality, but it is also a very practical tool for film makers. Many competing digital systems require the cameras to be tethered to large cumbersome VTR machines. The Epic gives us back the ability to be totally cable free, even when working in stereo. I'm a big fan of the new RED camera technology myself, and this new RED EPIC sounds like a pretty incredible camera. This is the future of filmmaking and camera technology and this movie is going to look great up on the big screen! The Hobbit is expected to start filming back to back early next year with a 2012 release expected for part one and 2013 release for part two. 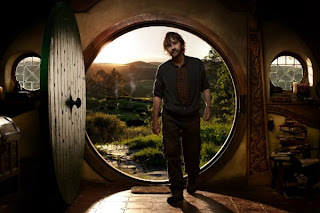 The Hobbit movies will be directed by Peter Jackson, and will star Andy Serkis, Ian McKellen, Martin Freeman, Richard Armitage, Rob Kazinsky, Aidan Turner, Graham McTavish, John Callen, Stephen Hunter, Mark Hadlow, Peter Hambleton, James Nesbitt, and Adam Brown.